During the latest invasion, the soldiers fired live rounds, rubber-coated steel bullets and gas bombs, at local youths, who hurled stones and empty bottles on the military vehicles. It was mainly focused near some schools in Abu Dis, while more clashes took place, starting on Thursday evening, after the fatal shooting, and extended to late night hours, especially near the military base, close to the main entrance of Shu’fat refugee camp, in Jerusalem. The soldiers also invaded homes in the refugee camp, and abducted a child, identified as Khader al-Kiswani, before moving him to an interrogation facility, in Jerusalem. On Thursday at dawn, the army invaded Jenin city, in the northern part of the occupied West Bank, and clashed with local youths, causing many to suffer the severe effects of teargas inhalation, and confiscated three computers from the home of a blind former political prisoner in Ya’bad nearby town. In addition, the soldiers invaded Tubas city and the al-Far’a refugee camp, in the northeastern part of the occupied West Bank, shot and injured one Palestinian, and abducted two others. 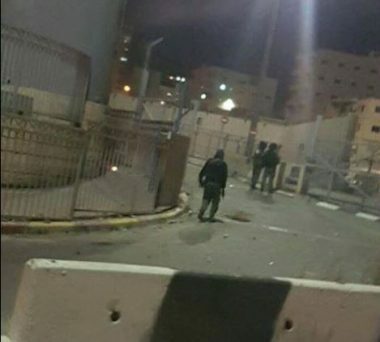 Also at dawn the army invaded the towns of Beit Ummar and Bani Neim, in the southern West Bank district of Hebron, searched homes and abducted two Palestinians.